During the recent 25th Annual NASBITE conference held in Portland, Oregon I had the pleasure of chatting with a veteran trade professional, Leif Holmall, about his interesting book on International Business. His book: “Export & Import – Winning in the Global Marketplace”, is a practical handbook for how to do international business. It suits both the person who is new to the game as well as representatives of business organizations who want to improve their skills for a more advanced professional approach. The book takes the reader step by step through topics such as culture, women in international business, researching market information, finding and activating a foreign representative, setting up distribution channels, export pricing, shipping, how to get paid, dealing with different currencies, adapting products/services, sales material and organizations to new markets, legalities, staff training and much more. The text contains hundreds of real-life examples from the author’s over 40 years of experience conducting international business in about 100 countries. It also presents case studies from other business people and organizations. His Website: ExportPro.com compiles information garnered from the author’s 40+ years experience doing business in 100 countries and delivering consulting, business education and coaching services, to help expand businesses into international markets. He is also the creator of the innovative Export Master® program. EXPORT MASTER® is a program for those who wish to rapidly improve their export and global business skills. The program includes a combination of education, training, practical work and advice to develop individuals and groups within the company into a more knowledgable and active team. It works with all staff members ranging from the president and chairman of the board to those involved in marketing, finance and shipping. 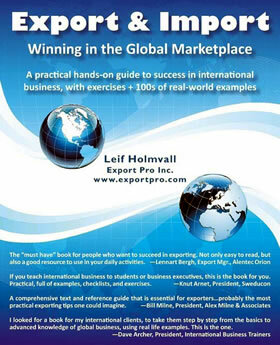 The Author: Leif Holmvall, the owner and President of Export Pro Inc. He has lived and worked in both Europe and North America and gained his experience as an executive of several Swedish companies covering a broad range of industries. 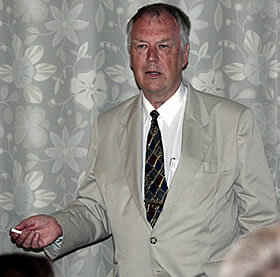 Leif served as Swedish Trade Commissioner to Canada. He has operated his own consulting companies since 1982 assisting foreign companies to do international business. Most of his companies’ work is with overseas clients. Part of the business includes acting as an agent or representative for foreign companies to set up distribution channels, and select and activate distributors. His clients include companies in North America, Europe and Asia.